Around the year 1740, brothers William and Edward Patterson (or Pattison) arrived in New Britain from Scotland in search of a new life. Unable to find suitable land for farming, the brothers took to tin making—a trade they had learned in England. Tin making required little capital or labor, and Americans coveted the finished products. 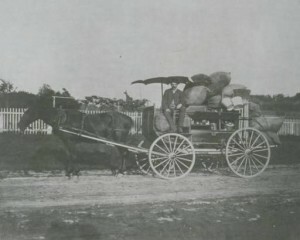 The Pattersons traveled to Boston, where they picked up tin sheets they had imported from England and carried them on horseback all the way back to New Britain. Once they turned these tin sheets into useful kitchen utensils and other consumer products, the two men packed their goods in a sack and traveled door to door to sell them. Early success led to rapid expansion and the brothers began fixing baskets to horses so that they could travel further distances. This success caught the eye of many would-be entrepreneurs and soon an entire network of “Yankee peddlers” sprang up in the region. Yankee peddlers were primarily New England-born. While the rural economy of the North in the 18th century focused on local exchanges of goods within a community, Yankee peddlers used their geographic mobility to bring finished products directly to the consumer—bypassing local merchants. Consequently, local citizens and businessmen often viewed these outsiders with a great deal of suspicion and, sometimes justifiably, Yankee peddlers received a reputation as immoral and deceptive salesman. Regardless of this reputation, however, their goods proved to be in high demand and they continued to find new and innovative ways to meet that demand. Improvements in transportation helped spread the influence of the Yankee peddler. The development of turnpikes allowed peddlers to use wagons, and the building of canals meant goods could travel through the myriad of navigable waterways in North America. 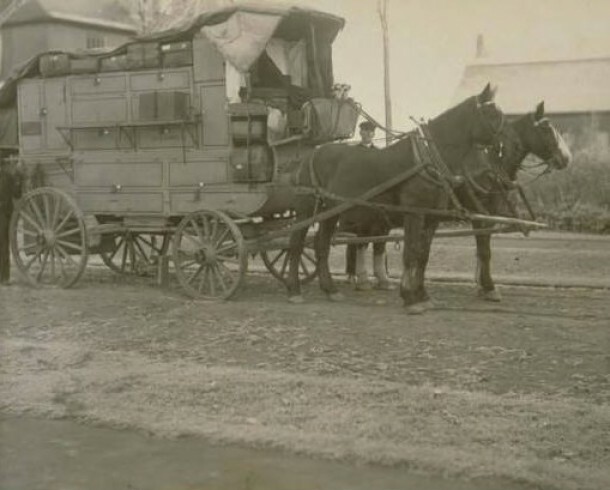 By the early 19th century, Connecticut peddlers traveled to such faraway locations as Albany, New York, and Richmond, Virginia, on trips that lasted six to eight months, before selling their horses, wagons, and other supplies and returning to Connecticut to start the process over again. The Yankee peddler helped make Connecticut a leader in the tin industry. The business model started by William and Edward Patterson in New Britain flourished as a blueprint for a number of other industries in the state as well. Clockmakers like Eli Terry used peddlers to sell over 4,000 clock movements in 1806, and peddlers also had a hand in the development of the early brass industry. Eventually, the very market culture they helped create brought about the end of the Yankee peddler. Large manufacturers with centralized sales forces and mechanized facilities proved more adept at producing and delivering manufactures to consumers. Railroads aided these facilities in delivering large amounts of goods to trusted local retailers, eliminating the need for peddlers. What the Yankee peddler did accomplish, however, was to forever change early market structures in the North and foster the development of a consumer culture in the United States.